Tobias Kramer with the GPU cluster at Harvard (Picture courtesy of Academic Computing, SEAS Harvard.) © Tobias Kramer, 2017. Interference effects are a signature of the quantum mechanical nature of electron transport in nano-devices. However, the phase information encoded in the transmission amplitude is not directly accessible experimentally. 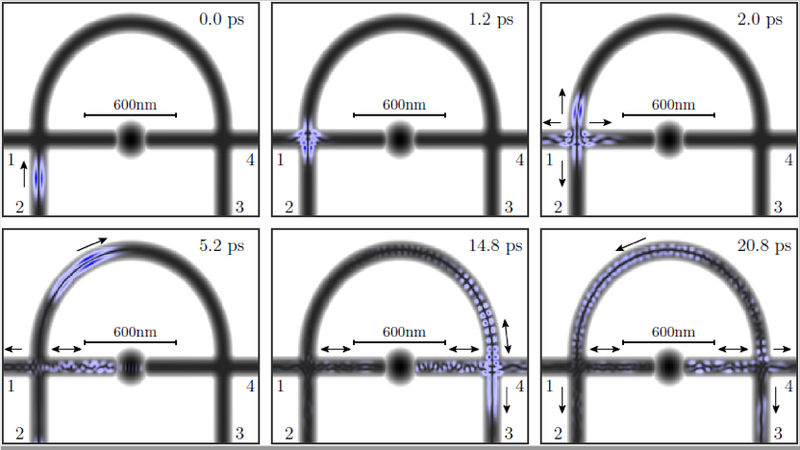 One idea for extracting the phase information of a quantum dot is to place it in an Aharonov-Bohm (AB) ring and to study the interference pattern as a function of well controlled external magnetic and electric fields. The transmission phase can then be inferred from the changes in the AB oscillations. When the transmission is exactly zero, the phase is not defined and a phase lapse appears that can be detected experimentally. The first experiments using these electronic interferometers were done about twenty years ago by a group at the Weizmann institute; they were extremely surprising and still they are not fully understood. For instance, a universal regime appears where phase lapses occur in between every couple of resonances. A random model for the dot predicts that this should occur only half of the time. There are many theoretical papers trying to explain these results and perform better than the random model; the more successful of these depend either on electronic interactions or on the chaotic character of the dot. Current experiments do not have enough statistics to distinguish between the two competing theories. Snapshots of the time evolution of a wave packet through the device. Take from J. Phys. Cond. Mat. 155301 © IOP Publishing, All Rights Reserved. In our recent paper we show under which conditions a realistic AB ring can be used as a quantum interferometer that probes the intrinsic phase. The setup is based on the nano-electronic interferometers designed and investigated by the novel materials group of Saskia F Fischer (Humboldt University Berlin), with the addition of a well-defined dot. To probe the phase behaviour for a wide range of magnetic and electric de-tunings, we take advantage of computationally efficient methods rooted in wave-packet propagation. This allows us to extract the critical phase information for a whole range of energies from single wave-packets, and to convert an eigenvalue problem into the equivalent initial value problem. The large scale simulations rely on the computational power of Graphic Processing Units (GPU), which are in particular well suited for the required Fast Fourier Transform. Rafael Molina is a researcher at the Instituto de Estructura de la Materia in Madrid, he obtained his PhD in theoretical physics from the Complutense University and then did some postdocs at the IPCMS in Strasbourg, the CEA in Saclay and the MPIPKS in Dresden before returning to Spain. His research is mainly in theoretical condensed matter physics with current focus on quantum transport and the effects of time-dependent external fields. Tobias Kramer works as computational physicist at the Zuse Institute Berlin. After graduating from TU Munich, he moved to work with Professor Eric Heller at Harvard University on time-dependent quantum mechanics and later established a research group at the University of Regensburg, introducing GPU computing there. His research covers different areas of theoretical physics, with applications from astrophysics to nano devices and biophysics. Christoph Kreisbeck is a postdoctorial fellow at Harvard University with Professor Alan Aspuru-Guzik. During his PhD in the group of Tobias Kramer he pioneered the use of GPUs for open quantum system dynamics and together they contributed the GPU-HEOM cloud computing tool to the nanoHUB initiative. His current research focuses on transport in photosynthetic systems and machine learning.